Archangel Michael is the only angel who is mentioned by name in all three of the major sacred texts of the world's religions that place the most emphasis on angels: the Torah (Judaism), the Bible (Christianity), and the Qur'an (Islam). In all of those faiths, believers consider Michael a leading angel who fights evil with the power of good. Michael is an exceptionally strong angel who protects and defends people who love God. He is powerfully concerned about truth and justice. Believers say that Michael communicates boldly with people when he helps and guides them. Here's how to recognize signs of Michael's possible presence with you. God often sends Michael to help people who are facing urgent needs during a crisis, believers say. "You can call on Michael in an emergency and receive instant help," writes Richard Webster in his book Michael: Communicating With The Archangel For Guidance and Protection. "No matter what type of protection you need, Michael is ready and willing to provide it... No matter what sort of situation you find yourself in, Michael will give you the necessary courage and strength to deal with it." In her book, The Miracles of Archangel Michael, Doreen Virtue writes that people may see Michael's aura nearby or hear his voice audibly speaking to them during a crisis: "Archangel Michael's aura color is a royal purple that's so bright, it looks like cobalt blue... Many people report seeing Michael's blue lights in a crisis... During crises, people hear Michael's voice as loudly and clearly as if another person were talking." But no matter how Michael chooses to manifest, he usually announces his presence clearly, writes Virtue, "More than seeing the actual angel, most people see evidence of Michael's presence. He's a very clear communicator, and you're likely to hear his guidance in your mind or sense it as a gut feeling." Michael may visit you when you need encouragement to make faithful decisions, to reassure you that God and the angels are really watching over you, say believers. "Michael is concerned chiefly with protection, truth, integrity, courage, and strength. If you are having difficulty in any of these areas, Michael is the angel to summon," writes Webster in Michael: Communicating With The Archangel For Guidance and Protection. He writes that when Michael is close to you, "you may get a clear picture of Michael in your mind" or "you might experience a sense of comfort or warmth." 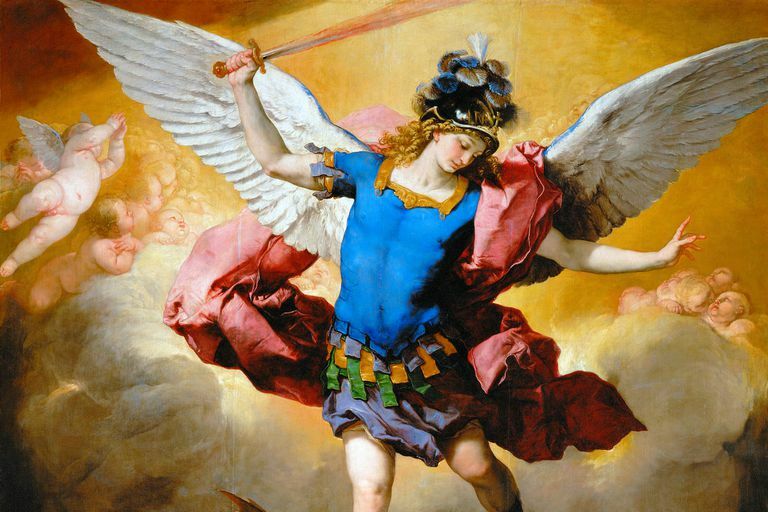 Michael will be glad to give you comforting signs of his protection that you can recognize, writes Virtue in The Miracles of Archangel Michael, "Since Archangel Michael is a protector, his signs are designed to comfort and reassure. He wants you to know that he’s with you and that he hears your prayers and questions. If you don’t trust or notice the signs that he sends, he’ll communicate his message in different ways... The archangel appreciates your candor with him, and he’s happy to help you recognize the signs. The comfort that Michael provides is especially helpful for dying people, and some people (such as Catholics) believe that Michael is the angel of death who escorts the souls of faithful people into the afterlife. Michael wants to motivate you to become more organized and productive to fulfill God's good purposes for your life, writes Ambika Wauters in her book, The Healing Power of Angels: How They Guide and Protect Us, so such guidance that you receive in your mind may be signs of Michael's presence with you. "Michael helps us develop the skills and talents we need that will support us, and benefit our communities and the world," Wauters writes. "Michael asks that we be organized, find a simple, rhythmic, orderly routine in our everyday life. He encourages us to create constancy, dependability, and trust in order to thrive. He is the spiritual force that helps us create a healthy foundation that gives stability and strength." Like other angels, Michael may choose to show you flashes of light when he's around, but Michael will combine that spectacle with substantial guidance that he gives you (such as through your dreams), writes Chantel Lysette in her book, The Angel Code: Your Interactive Guide to Angelic Communication. She writes that a "way to discern whether unexplained phenomena somehow indicates an angelic presence is the question of consistency. Michael, for example, will give off small flashes of light to let you know he’s around, but he will also let you know by using connections that you’ve already established with him, be it clairaudience, dreams, etc. It is much better to foster this kind of relationship with your angels, seeking out connection through personal, intimate experiences every day, rather than relying on spectacle." Lysette cautions readers to "make sure you’re grounded before you form any conclusions about what you saw" and to approach signs from Michael (and other any other angel) with an open mind: "...look for signs casually, with an open mind, and not become obsessed with trying to find them and dissect what they mean. At the very foundation, they really only mean one thing—that your angels are walking beside you every step of the way as you journey through life."